Vibor Cipan CEO @viborc Vibor is currently serving as a CEO of UX Passion, a full service UX design and usability firm with global reach. 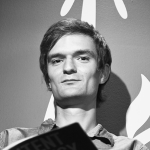 Vibor's professional background is in UX design, service design and usability. Along with leading UX Passion, Vibor is an active and trusted consultant and presenter on tech topics as well as an published author, having published in 2010 his first book about building great UI and UX. In his free time he can be found on a bike, traveling, enjoying music, experimenting with agriculture and all things 8-bit.